The heat loss is a function of the pipe size and insulation quality, the steam temperature (pressure) and the surrounding temperature. The table below and figure above can be used for estimating heat loss from bare uninsulated horizontal steam pipes - still air conditions - air temperature ranging 50oF to 70oF. Engineering ToolBox, (2003). Heat Loss from Steam Pipes. 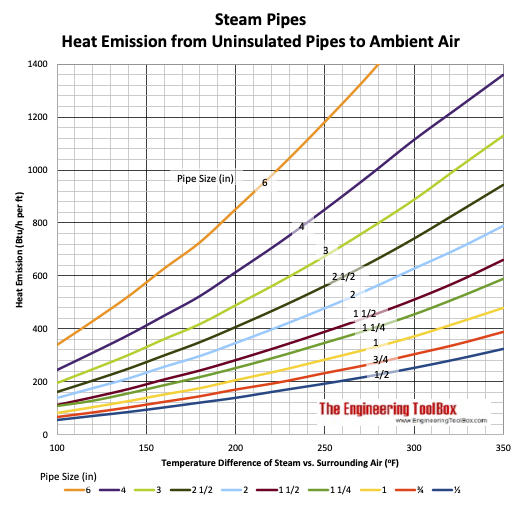 [online] Available at: https://www.engineeringtoolbox.com/heat-loss-steam-pipes-d_268.html [Accessed Day Mo. Year].